While both conditions affect the thyroid, hypo- and hyperthyroidism have very different effects on the body. The thyroid may be a small gland, but it produces hormones that the brain, heart, stomach and organs need to function. 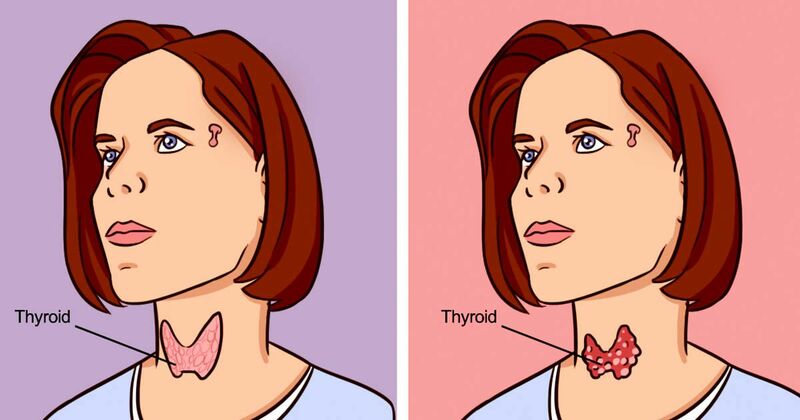 When your thyroid doesn't work properly, it can have a serious effect on the rest of your body's systems, according to Everyday Health. The difference between hypothyroidism and hyperthyroidism is the output of hormones. Hypothyroidism means your thyroid isn't making enough hormones, whereas hyperthyroidism is when your thyroid makes too many hormones. Hypothyroidism is a condition where the thyroid is underactive -- more specifically, the thyroid gland doesn't produce enough of certain hormones, upsetting the normal balance of chemical reactions in the body. According to the Mayo Clinic, there are a variety of causes and symptoms for hypothyroidism. Doctors usually turn to the standard treatment of the synthetic thyroid hormone levothyroxine. This medication is taken orally daily to restore adequate hormone levels and reverse the signs and symptoms of hypothyroidism. It may take time to figure out what dosage is right for you, and you will work with your doctor to determine the best treatment. According to the Mayo Clinic, hyperthyroidism is a condition where your thyroid produces too much of the hormone called thyroxine. This can accelerate your body's metabolism, causing sudden weight loss, a rapid or irregular heartbeat, sweating and nervousness or irritability. - Graves' disease tends to run in families and is more common in women. - If another member of your family has a thyroid condition, talk with your doctor about what this may mean for your health. Older adults are more likely to have no signs or very subtle symptoms, and medications to treat high blood pressure and other conditions may also mask the signs of hyperthyroidism. - Surgery, which involves removing parts of your thyroid, but usually as a last resort. Often surgery is used with pregnant women who can't tolerate antithyroid drugs and don't want or can't have radioactive iodine therapy.